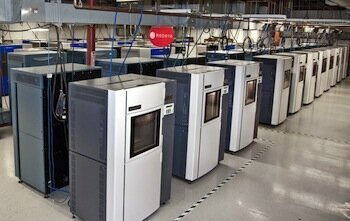 When will Additive Manufacturing arrive? Additive manufacturing is on the move towards transforming the entire manufacturing industry. Currently, mass-produced, common parts are still created traditionally with CNC and injection-molding processes, with 3D printers used for prototyping the parts before actual manufacturing begins. But as 3D printers add more material choices, design software improves, and printers get faster, we’ll see more and more parts being actually produced on 3D printers, not just prototyped. We’re already seeing this with some custom or small run simple parts and products, in addition to specialized parts in aerospace, medical devices and other industries, but we’ve got a long way to go until most everything goes directly from design file to a 3D printer for final product output. Leslie Langnau, editorial director of Make Parts Fast, has created a webinar on this very topic. She looks at the capabilities additive manufacturing machines will need to have to fulfill the dream of the third industrial revolution. I think you’ll agree this 15 minute presentation will be worth you time.